F.S. Coburn, RCA (1871 - 1960) He is best known for his Canadian winter landscapes with horses. Until now, the variety and scope of F. S. Coburn's other work (still lifes, portraits, illustrations, photographs...) and the more romantic aspects of his personal life (his loves, travels, passion for dance...) have been eclipsed by the huge popularity of his winter theme. 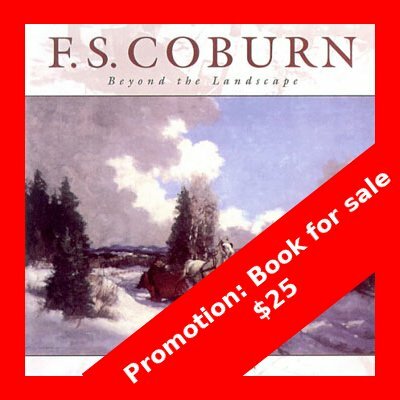 Finally, the full text of Frederick Simpson Coburn's story has emerged in an elegant book (F. S. Coburn: Beyond the Landscape ) and a stirring video (Two Worlds, Two Lifetimes ) which reveal the impressive scope of Coburn's art and personal details about his intriguing life. Find out more about this elusive man whose art continues to captivate so many. __________ The most impressive and comprehensive collection of Coburn's work is on permanent exhibition at the Musée des beaux-arts de Sherbrooke, in Sherbrooke, Quebec. A superb collection of his dance photographs is at the Musée du Québec in Quebec City. His paintings can also be viewed in galleries, museums and traveling exhibitions across the country.